Until passage of the 2018 U.S. Farm Bill, the U.S. government did not distinguish between recreational/medicinal cannabis and its botanical cousin, hemp. Beginning in 1937 it had been illegal to grow any variety of cannabis including industrial hemp in the U.S. Industrial hemp was placed in the same category as heroin under the Controlled Substances Act, a part of the so-called War on Drugs. But in 2018, as part of that year’s farm bill, hemp was finally separated from its botanical cousin, marijuana. Recognized as an agricultural commodity under the bill, things look much more optimistic for U.S. hemp production. 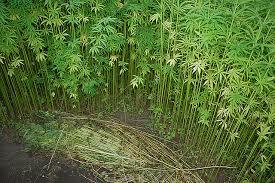 But as I noted here, there are still hurdles due to state laws that don’t distinguish hemp from marijuana. Further complicating matters are newly developed hemp plant strains bred for their high CBD content. Cannabidiol, abbreviated as CBD, is just one of the 113 cannabinoids that have been identified in cannabis so far. CBD extracts aren’t made to get you high; they lack significant amounts of another cannabinoid—THC—the stuff that produces marijuana’s euphoric effects. But the differences between industrial hemp versus strains of cannabis grown for medicinal and recreational purposes are pretty blurred in the public consciousness. Media often covers industrial hemp and non-psychotropic forms of cannabis with the same winking merriment and pun-laden headlines with which it treats stories about pot in general. Since I originally wrote Can I Get Arrested for Wearing Hemp?, states such as Oregon have legalized both medicinal and recreational use of marijuana as well as industrial hemp cultivation, which raises interesting questions both legal and botanical. These questions were sharply underscored as I recently drove along a nearby interstate. First, I passed a substantial crop of industrial hemp as proudly proclaimed by large signs on the farm indicating the crop will be used for CBD oil production. Within moments, another grow came into sight, but this one had a tall wooden fence surrounding it and no sign—just tall, Christmas-tree shaped plants peeking over the fence—typical of the dozens of cannabis farms in my county. Cannabis that’s been bred for high CBD content, such as that first field I encountered, actually poses a threat to any surrounding cannabis (i.e., marijuana) grows. Given the right conditions, pollen from the hemp field is capable of fertilizing other strains intended for medicinal and recreational use that grow miles away. These other strains are cultivated to remain unfertilized and seedless so as to maximize THC content in the marijuana flower buds. Having neighboring fields of industrial hemp is a potential disaster for those growers. Just as I was originally about to post this, a very positive headline hit my in-box: "FDA Declares CBD ‘Beneficial,’ Wants Your Input ASAP.” According to Leafly, the FDA is now seeking comments and information about CBD’s benefits in the treatment of neurological disorders and other conditions. Before getting too excited, however, it’s important to note that the FDA’s call for comments has only to do with recommendations the U.S. will make to the the World Health Organization. The WHO is currently reviewing a 1971 convention that includes all forms of cannabis in its schedule of outlawed psychotropic substances. Meanwhile, the outlook for domestically grown hemp being transformed into textiles here in the U.S. Is fraught with challenges. Starting in the 1970s, textile mills began exiting the United States in search of cheap labor and minimal regulation. Today the domestic textile industry is a mere shadow of its former self, mirroring the condition of U.S.-made apparel. Manufacturing textiles is both capital- and labor-intensive. Given the realities of the global economy that shape today's clothing and textile markets, I’m not counting on having a domestic option any time soon when it comes to purchasing hemp fabric grown, spun, and woven in the US. But who knows where all this is headed? Consumers have certainly become better informed about fast fashion and its many negative impacts on our planet. That awakened consciousness may transform both the way we make clothes as well as the materials from which they’re made. Perhaps, in their own almost imperceptible way, those customers of mine who “get” Sympatico are a sort of cutting edge—an advance party blazing a different path that approaches apparel making in particular and consumption generally in Earth-friendly ways.